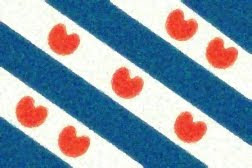 Fun With Frisian: IN STUIT - "a time, momertarily"
IN STUIT - "a time, momertarily"
Today, let's introduce a fairly common word with a pronunciation that may throw you for a bit of a loop if you are just reading it: stuit, pronounced with with the same vowel in the English "aye" or -"igh" like in "night" (I am also hearing, less commonly, a long "ah" in some places). The word shows up in expressions relating to a short time, but also seems to mean a goal-point in sports. Honestly, I chose this particular lesson because of the recent bad news regarding Omrop Fryslân: the media merger law passed this week and the station will be losing its independence under that new law. Perhaps it can be appealed to the European Union? I don't know. But the situation is unpleasant, and perhaps we can best focus on making sure that Frisian survives and thrives despite the present moment. For a moment, momentarily, for a time. Remember, op, meaning "on," "for," "to", "at, "by" (etc.) takes a similar vowel to the one in "pot" and in, meaning "a" or "an," takes a schwa. By blow and moment, e.g., immediately. Slach is said with the long "ah in "father" and the harsh "kh" in the German word Bach. It can mean many things, among them: "blow," "battle," "warp" or "a turning," "birdsong," or "a kind of." Op in stuit krijt men jins nocht. Thank you for the correction! It is much appreciated!